While I was making this, I didn't think I was going to write about it. I was just throwing together another cheesecake for my friends. 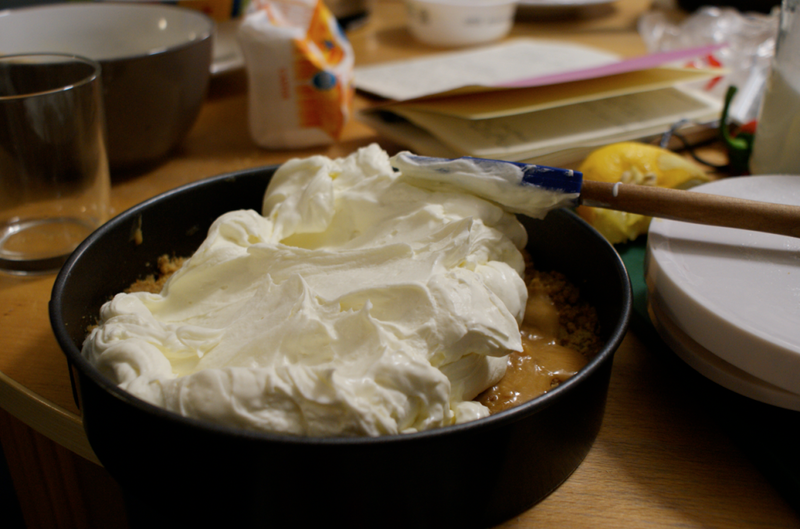 Then I had the idea of pouring caramel over the digestive biscuit base. Still, I didn't think I was going to post about it. As I now can't make food without taking at least some photos, I took a few rather all over the place shots. I hardly wrote down what I was putting in as I made it. Then we ate some. I really want to share this. I'm sure somebody much greater than me has had the idea of pouring caramel over a biscuit base...but damn. I had to share, despite the lack of composed photos or a concrete recipe. It reminds me a little of those lovely digestives that comes with a layer of caramel and then chocolate on top. It's slightly chewy yet tender and adds another whole dimension to the flavour. The sweetness is offset by the salted butter in the base and the sharpness of the raspberries. 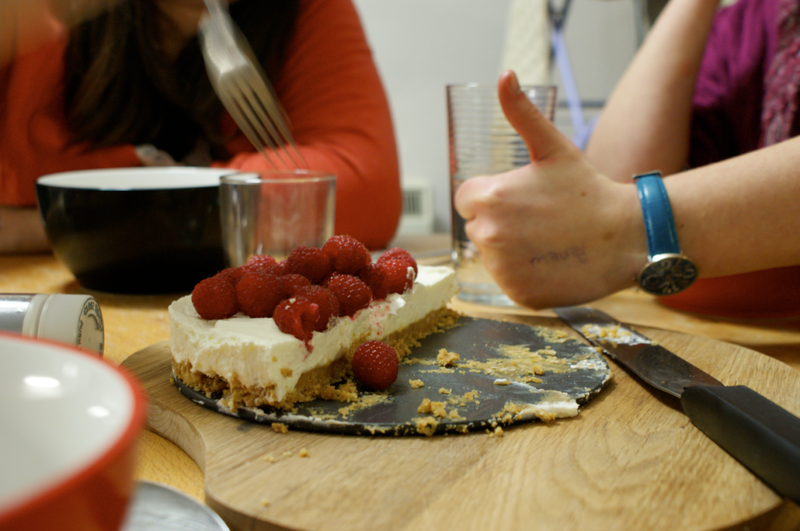 A perfectly good Tuesday evening cheesecake turned fabulous. When I make it again, I'm going to up the amount of caramel slightly and remember to maybe whisk it when I add the cream rather than just stir as I got some lumps (but oh dear, they were such tasty lumps). I've upped the amount of caramel below and tried to remember exactly what I did with the filling. 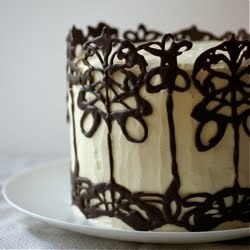 You could add gelatine or such to firm up the filling a little but I like it as it is. What can I say - it got the thumbs up from my friends. Place the biscuits into a plastic bag and bash them up with a rolling pin or something else that's handy. Melt the butter in a small pan, then stir in the crushed biscuits and salt. Tip it all into a 7-8" loose-bottomed tin. Spread out and press in. Put in the fridge to chill while you make the caramel. Spread the sugar out in an even layer in a small pan and place over a medium-high heat. Watch carefully - after a few minutes, the sugar will start to liquify at the edges but don't stir it. Once it's nearly all melted and starts to caramelise, swirl it all together. Keep heating until you have a deep golden-bronze colour the take off the heat and quickly pour in the cream and stir in. Keep stirring until smooth then add the salt. Pour over the chilled base and tip around into an even layer. 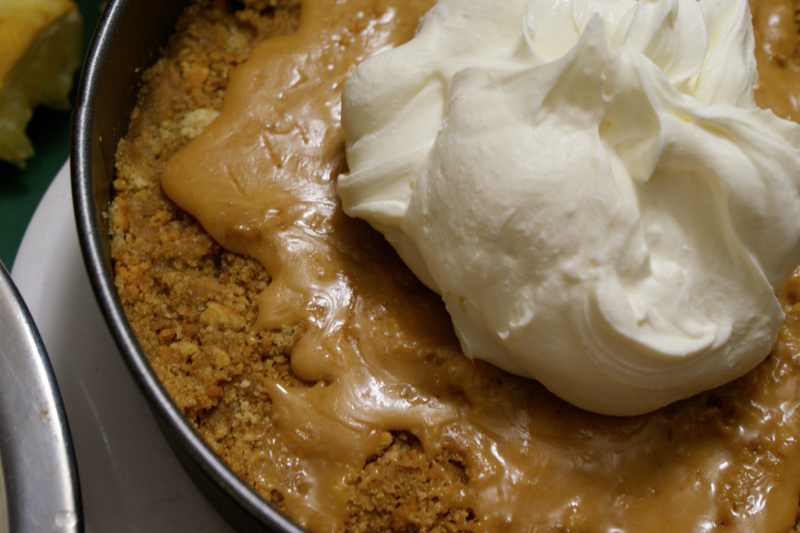 Place back into the fridge and chill for 30 minutes or until the caramel has set. Beat the mascarpone and cream cheese together then whisk in the sugar and lemon and lime juice. Whip up the cream to soft peaks then fold it into the mascarpone mix. Scoop onto the base of the cheesecake and smooth over, making sure you get it down into the corners. Chill for 1 hour or until you're ready to serve. 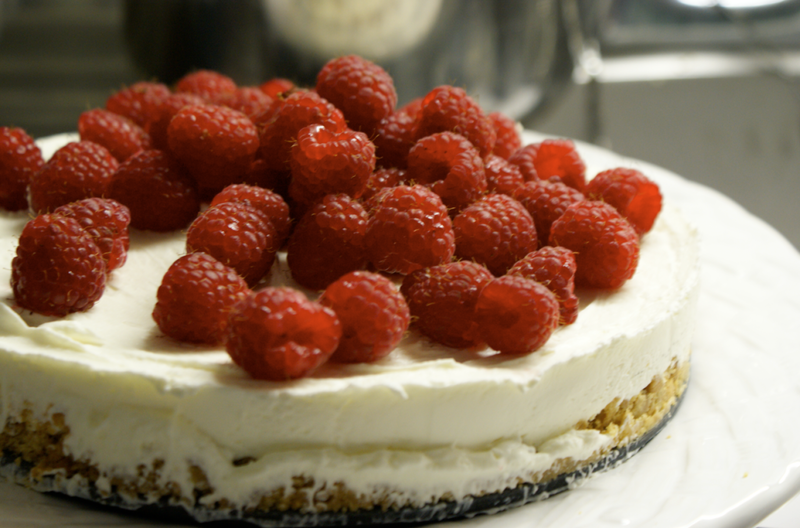 Remove the cheesecake from the tin and top with the raspberries. Keeps in the fridge for 2-3 days. And a very good thing that you decided to post this! Looks and sounds completely fabulous. I know what you mean about needing to take photos of things you don't even necessarily plan on talking about in your blog. Sometimes you hit on something wonderful and unexpected, though, like your raspberry caramel cheesecake. This looks like a great recipe--really great!! it would have been a shame not to hear about your (btw. beautiful!) cheesecake! One of the girls at work has been nagging me to make her a caramel cheesecake so I do believe you've just saved my bacon!!! Thank you all for your comments, it's lovely to hear you're glad I posted this! I baked this cake last week at home for my little sister using Spanish cheese instead mascarpone,it was amazing, my sister was amazed,(she never likes my cooking), so why don´t you give it a try?, I´m pretty sure you´ll like it too, just have a look at their website which I find very interesting. hey i love your recipes i was working if there is another type of cheese i can use instead of mascarpone? Zara - I haven't tried it but I'm sure most creamy soft cheeses would work - you could use all cream cheese etc. Hope that helps. I've been searching for something special to make for my boyfriend's birthday and these images are the closest to my vision that everything else I've seen!! caramel... cheesecake.. crumbly base... a crossover between banoffee and cheesecake comes to mind! I'll definitely give it a try. Love your blog and the metric measurements brought to me a sigh of relief! I can never be sure when I see cups and ounces on recipes! Keep us inspired!! each parties concerned and concentration on that, not other individuals. This really is primarily crucial for people who need to shift merely a number of lbs . be a big inconvenience when you have to have to undo the pin, slide from the weight, set the pin back on, and so forth. which also allow you to accomplish squats and a lot more. I've experimented with other manufacturers like Weider and Soloflex and so they never even come close to your Bowflex when it comes to the quality and effects. grip pulse sensor and also a deck that folds. These configurations can provide your whole body a problem instead from the exact standard footsteps. Also, the gamers comfort is usually a issue in regards to decide on thickness. Every device also comes by using a absolutely free rubber floor mat.